The City of Scio and the surrounding community has struggled with flooding issues since the beginning of the settlement in the late 1800s. Historical records indicate there was a flood event of unknown size in 1890 and 1904. On December 20, 1917 “Scio was flooded in a way not since 1890”. By 10:00 am water had invaded Main Street and was flowing into Chas. Wesely’s store. The sidewalks were inundated by 5-6 inches of water and Jim Bilyeu’s property was surrounded by water of more than a foot deep (Bates, 1989). Old timers tell the tales of the 1919 winter snows/big freeze and floods that followed. “You couldn’t get out of town in any direction”, “It (the floodwaters) was running out of Gill’s store across the street just like a crick”, and “The whole country was under water from Leffler Hill to Franklin Butte” are just some of the comments made about the 1919 flood. The only dry ground in Scio was the land where the current Scio High School is located (Bate, 1989). In ere recorded where Thomas Creek was a bank full stage and a few businesses and homes in lower lying areas had a few inches of water in them. Then there was the flood of 1945 that resulted in 14 ½ inches of water in homes east of the Post Office and Gills’ store which had a crick running through it in 1917 just had a few inches of water not enough to reach the main store floor (Bates, 1989). In January of 1946 high water again caused problems in Scio by washing away a 500 gallon fuel oil tank at the Warren residence. In more recent times Scio has seen the floods of 1964, 1972, 1996, 1998, and 2012. The 1964 and 1996 floods were the largest of the events. It is not clear how they relate in size to the 1890 and 1917 floods but it is safe to say that they will not soon be forgotten. The 1964 flood inundated all of Scio with most areas experiencing shallow depths and a few areas near Thomas Creek had water depths of 3 feet. The 1964 flood event is described as a 200- year flood event according to the Federal Emergency management Agency Flood insurance Study. In comparison the 1972 flood is characterized as a 50-year flood event. there was less overland flooding in Scio during the 1972 flood but a logjam caused considerable damage when it destroyed Shindler Bridge. The 1996 flood inundated most of the 100-year floodplain and some areas that are mapped as 500-year floodplain. Flood flow patterns int eh 1996 flood were changed by modifications to the Jefferson-Scio Road, topography changes in the agricultural field north of town, and changes in the watershed above Scio. The obstructions and changes resulted in changes to the hydraulic gradient thus forcing water into the north part of town. The 1996 flood waters were lapping at the doors of businesses on the west side of Main Street and were coming up through the floors of the businesses on the east side of Main Street. City Hall had 1-2 inches of water in it from water coming up through the foundation. The 1998 flood event was much smaller flood event than the 1996 event resulting in shallow sheet flooding in low lying areas. 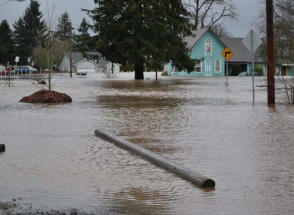 The 2012 flood again impacted the north side of Scio. Several homes in the Jefferson-Scio/NW 4th Avenue/NW Cherry Street area were flooded and have since been removed from the floodplain. The several of the businesses on Main Street had flood waters enter the buildings. It is clear from the flooding history that weather conditions that cause flooding in Scio have some of the same characteristics. First, most flooding events occur from October to May during the rainy season. Second, most flooding events are preceded by snow fall accumulation below 2000’ elevation in the foothills east of Scio. And finally, weather conditions referred to as a “Pineapple Express”, warm wet weather systems originating in the South Pacific near Hawaii, dump rain on top of the snow. These rain-on-snow events result in rapid snow melt and excessive runoff which causes flooding of Thomas Creek and Peter’s Ditch (irrigation/drainage ditch) on the south side of town.